I don’t know if you noticed, but I have not been adding too many grains or starchy foods in my recipes lately. I have been doing a little experimenting with how foods react to my body, so I hope you don’t mind and join in the fun! 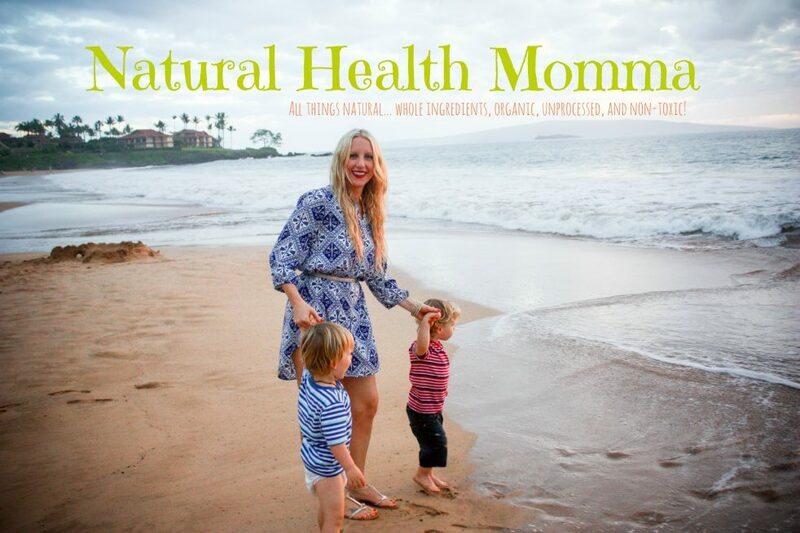 As someone who has issues with blood sugar, I am always looking for ways to manage my symptoms as well as including as many healing foods (fruits and vegetables) as possible. Everyone can benefit. Cauliflower, although not very colorful, is still considered to be one of the worlds healthiest foods. It is full of Vitamin C, Vitamin K, folate, is also packed with fiber, and obviously low in carbohydrates. Cauliflower is a great choice to have each week as part of your diet and can be very versatile. Steaming can get boring! 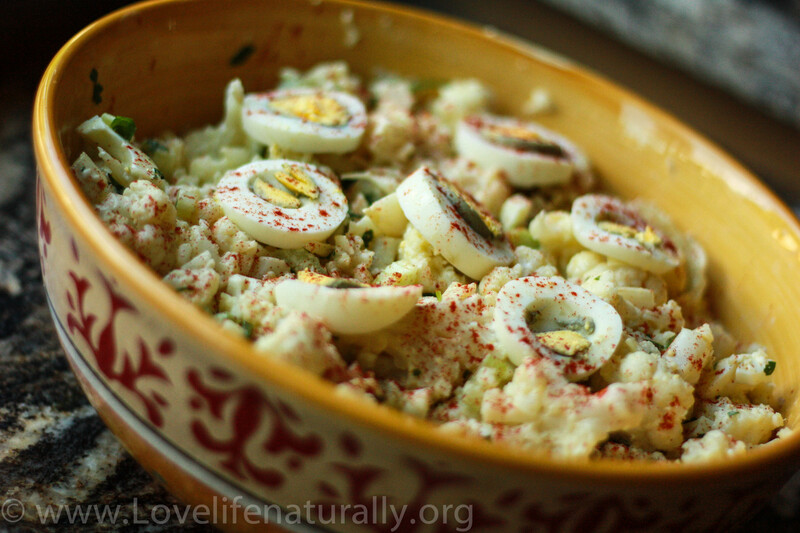 That is why I’m excited to share this new and healthy Potato Salad Recipe. Begin by chopping rinsing and steaming cauliflower in a steaming basket in an inch or water on medium heat. I have learned to cook on a much lower heat to preserve nutrients and not over cook. You should only steam for about 10 minutes max once the water begins to boil. You do not want the cauliflower mushy. 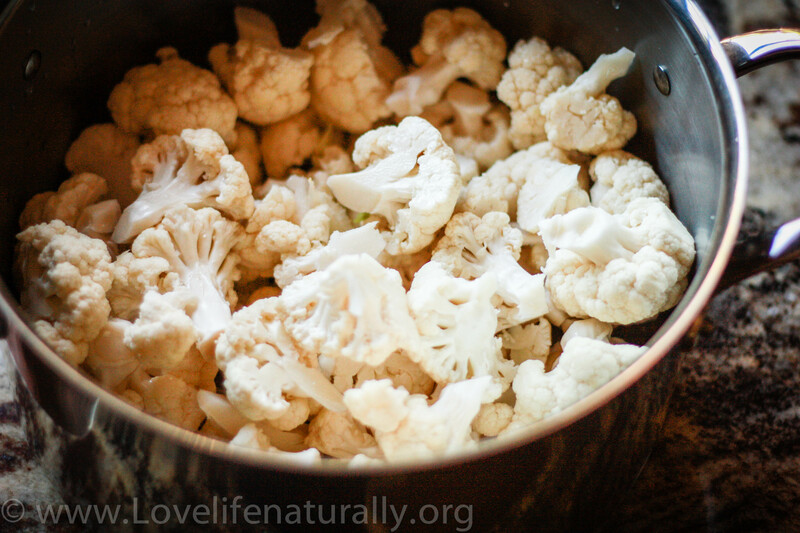 Drain cauliflower and rinse with cold water to prevent further cooking in a colander and drain all water. 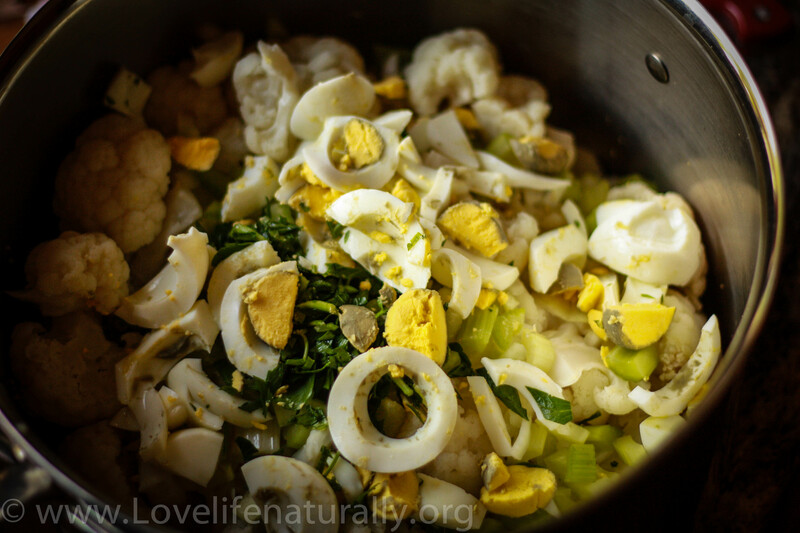 In a large bowl add the cauliflower, parsley, chopped onion, chopped celery, and four of the eggs chopped. In a separate bowl mix the mayo, mustard and salt to taste. Add to Cauliflower bowl and toss gently to combine. 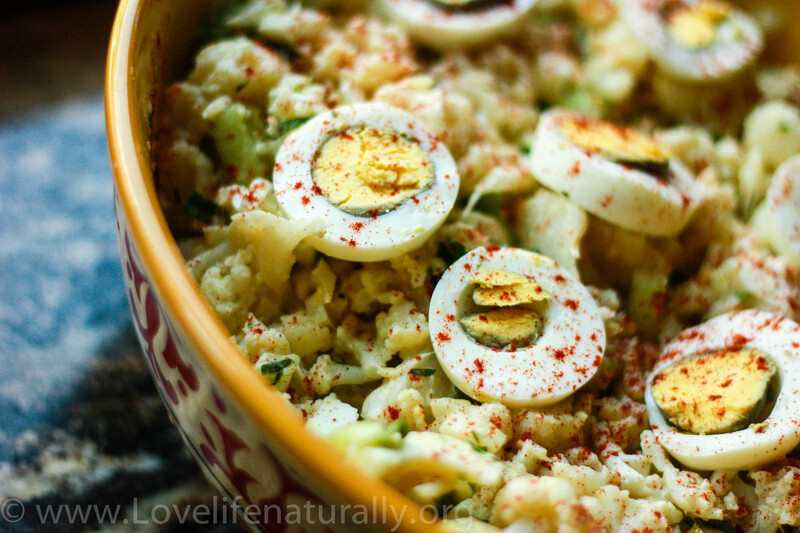 Add to a serving bowl and decorate with the remaining two hard-boiled eggs. Sprinkle with a little paprika for color (optional). Cover and chill for an hour or more before serving. There are events we go to where there are not always the healthiest options. I always try to bring something I know we can feel good about eating. This is a great dish to bring to any get together, party, BBQ, or just to have with your family!